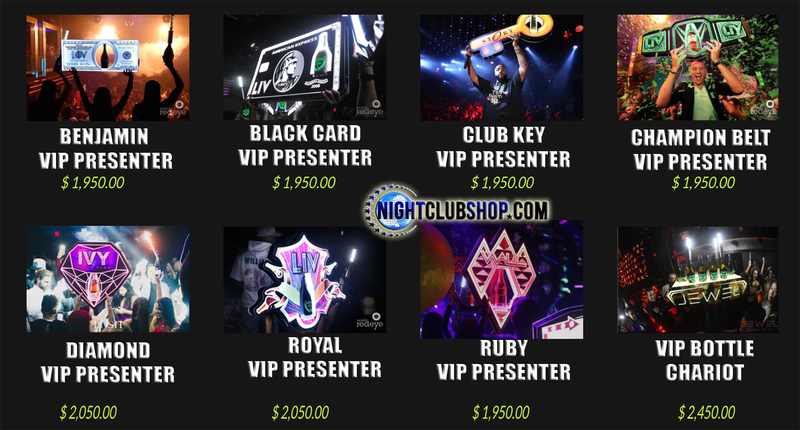 Brand NEW and EXCLUSIVE to Nightclubshop.com, for your VIP Bottle Service and Presentation needs, We are proud Service providers of the exclusive and Amazing HYPEMAKERZ "VIP Monthly Service Plan" allows our clients to get any product at a fraction of the cost up front. It also services as a full warranty replacing any damaged or broken products with a new unit free of charge. This program offers our products at an affordable price for any size budget. How it works- Depending on the product there's a small initial payment starting at $325.00 per product. After the initial payment, there will be a monthly service charge as low as $80.00 per month. NO CONTRACTS: Cancel at any time with no penalty or fee. ADD/REMOVE PRODUCT(S): You can add or remove any product from our Monthly Service Plan at no additional cost. EXCHANGE PRODUCT(S): To exchange one product for another, the client will only pay for the initial payment of the product. INSURANCE: All of our products are back with a 100% replacement guarantee with the Monthly Service Plan. If any product should break or get damaged we will replace the unit at no additional cost. Convenience- Ability to choose which day of the month you would like your monthly charge to be withdrawn, via ACH debit. You will receive a notification email before your payment is charged, and a confirmation email once payment has been processed. "LOVE IT! Finally a VIP Monthly Service Plan for Nightclubs that really works!" With cutting edge designs and branding capabilities, our champagne bottle presenters are guaranteed to set you apart from your competitors. Animating your logo along with an expensive champagne celebration has become extremely valuable in the social media driven society we live in today. Not only will this give your consumers great content to market your brand with, but it also creates leverage for potential clients to spend money based on wanting the same visually appealing celebration. This product has been proven to give you a return on investment within the first month of its purchase. Custom graphics and branding available. Option 1: You can purchase any of these selected VIP Products outright and you will receive a 1 year warranty on craftsmanship and manufacturer defects. Option 2: You can purchase our Nightclubshop VIP Monthly Service Plan which makes these VIP products VERY affordable. You pay an Initial Payment which is reasonable, and then you pay a monthly charge debited directly from your checking account on the first of the month with your first payment starting the month following your purchase. This is a monthly service plan designed to help smaller Nightclubs,Bar's,Lounges, and entertainment Venues ensure that their VIP Bottle Service products will never be out of service or unusable due to an accident whether it is your fault or not. With this monthly service plan you get the VIP Product or Products of your choice with your own Name,Text, Logo, or Graphic designs, or you can choose a custom made presenter made specifically for your needs and Branding, and if 3 months down the road you drop it or it breaks, we will fix or replace the unit within 2 weeks of receiving it. You will be liable to cover the costs to ship it back and forth to us for repairs. Your Nightclubshop VIP monthly service plan ensures that you don't have to invest in another initial payment for your service tray as long as you pay the monthly service plan fees. If for any reason you would like to cancel the monthly service plan there are no penalties to cancel the service as long as you return the product to us before your next monthly service plan due date. Once we receive the VIP Bottle Presenter or VIP Product back in our warehouse, we will stop your Service Plan monthly fees with no cancellation fees or gimmicks. If you should want to purchase a few of our VIP Monthly Service Plan items then we will give you a preffered discount for multiple products. 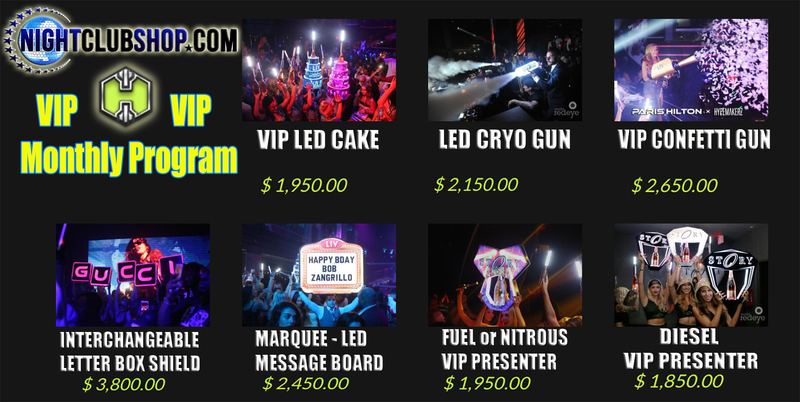 This way you can use a LED birthday cake, a VIP Bottle Presenter or two, LED Cryogun, and a VIP Confetti gun at your disposal for only a few hundred dollars a month service plan. Before purchasing if you have any question please call us first. 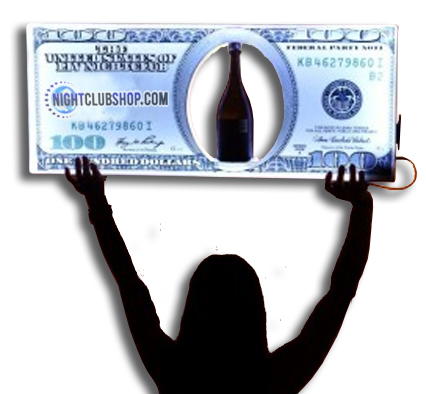 NIGHTCLUBSHOP HYPEMAKERZ VIP - Over years of research and development we have create multiple tools that have proven to generate revenue. How does our products generate revenue? First, Nightclubshop VIP will give your staff the integrity and confidence to leverage potential clients to spend more money based on the visually stunning and fun elements associated with our products. Secondly, these production tools are crucial when creating fun filled environment that will keep a higher occupancy until the event is over. Creating an entertaining and fun filled environment is the platform that will favor your consumer to spend more money. Whether it’s another round of bottle service or drinks at the bar, our products contain that significant fun element that will keep your guest excited and not wanting to leave. Finally, all of our Nightclubshop VIP products have been designed to be fully customizable for branding purposes. This is crucial in relevance to the social media driven world that we currently live in today. When it comes to marketing your business it’s extremely valuable to have suited content that will solidify and strengthen your brand. Our ultimate goal is to provide these essential tools that will help market and propel your business or brand to the next level of success.